Based on reader comments and what I see around the internet, the off grid amateur radio community seems to be of the mindset that there are only two real options for solar energy: Large, expensive arrays that produce a lot of power but are permanently installed, and small inexpensive panels that are light and portable but produce very little useful energy. Not surprisingly, many hams would like to have it both ways: Powerful enough to do something besides charge batteries or push a QRP radio while compact and light enough to hit the road. There is a DIY answer: The portable solar power station. My regular readers will know that I am always harping about how alternative energy is a series of compromises & tradeoffs. To get something, you always have to give something else up. That theme applies here too, but this portable power station does a pretty good job of balancing it all out. To the extent that it’s possible, the off grid ham will get the best of everything while mitigating the disadvantages. With average sun, this 150-300 watt portable solar power station will produce enough energy to run a 25-50 watt radio all day (or a 100 watt radio on a conservative duty cycle) while at the same time charge batteries and power other modest loads, such as a laptop computer. It greatly extends off grid ham abilities beyond handheld radios without the burden of hauling along a heavy mechanical generator and the fuel to run it. Amateurs who want an all-in-one setup to use on a home station but also have the option of taking it out in the field. Solar power for amateur radio in rental units/HOA-controlled property where permanent solar installations are not permitted or are logistically difficult. Ham radio clubs –for Field Day, EMCOMM, and community events. Solar power for seasonal property (hunting cabins, summer cottages, etc.) where you do not want the equipment left behind in the off season. This setup is portable in the “carry it in the trunk of your car” sense, not “strap it to your back and walk all day” sense. It is still somewhat bulky and heavy but is realistically transportable and offers a very good power payload for its size and weight. Substitutions are totally acceptable. This is meant to be flexible. 32 amp-hour battery $79.95. Use a sealed AGM or “gel-cell” type battery. Do not use “wet cell” or flooded batteries due to acid spill hazard. Battery box $7.00-$9.00 -Available from Walmart, sporting goods stores, etc. Assorted wire, plugs, connectors, hardware, mounting board $30.00. I realize nearly $1000 is a serious cash outlay for a lot of radio amateurs. But how much would you drop on a nice HF radio? For preppers/survivalists, how much would you expect to fork over for a decent AR-15 rifle? Although this project is not cheap, it’s comparable to other essential big ticket purchases and important enough to be worthy of its price tag. Also keep in mind that a commercially made “solar generator” will cost at least as much if not more and they don’t even produce a lot of power. This previous Off Grid Ham article explains the pros and cons of solar generators. Let’s trim the bill down. This Off Grid Ham article about charge controllers discusses MPPT vs PWM and why MPPT isn’t a good fit for small systems. TOTAL SAVINGS= $212.39. We now have the cost of the portable solar power station down to $765.67 without any major givebacks in functionality. Let my experience be your discount! Substitute the 150 watt, $293.00 Kyocera panel with two 100 watt, $126.99 (each) Renogy panels. This will whack another $40.00 off the cost of this project and give you fifty extra watts of solar! Fair warning: Two 100 watt Renogy panels combined are bigger & heavier than one 150 watt Kyocera panel. The Blue Sky MPPT controller will go to about 300 watts (400 for the PWM), so you can add panels up to the amperage limit of the controller. That in turn will require additional batteries. Keep in mind that these additions will significantly bump up the price and can evolve into mission creep farther and farther away from the original goal of portability & affordability. At some point your portable solar power station may no longer be portable. I’ve been running my portable solar power station with one 135 watt Kyocera panel (no longer in production) for years now and get great performance. I also use the Renogy panel on other projects and am very satisfied with those as well. Use your own judgement as to whether added space, weight, and cost is worth the effort. I decided to use a vertical format for my portable solar power station. Of course, it does not have to be this way. Arrange your components any way you please. It may help to lay them out on the mounting board and experiment with a few different configurations before permanently attaching anything. Pay particular attention to the wire runs, plug clearances for your equipment, and ease of access for troubleshooting. You may also want to leave some empty space for adding accessories later. Use 8 gauge wire for the inverter and battery. The other connections can use 12 gauge wire. The two bus bars are the central connection point for the entire portable solar power station. The battery terminates on the bus (+ and -). Be sure to include a circuit breaker or fuse between the positive side of the battery and the positive bus. The other points on the bus are used to connect the inverter and automotive plug. Connect positive to positive and negative to negative. It’s not complicated, but screwing it up has significant consequences. Connecting the output of the charge controller has two options: It can be terminated directly on the battery, or, it can be terminated on the bus. It will work fine either way. The battery method is safer because power to the entire system will be controlled by the breaker/fuse. With the bus method, the system will still be energized from the solar even if the battery is disconnected. Safety tip: For both methods, be aware that you will have to disconnect the battery and the solar panel to completely de-energize the system! Refer to diagram 1. Use one method or the other but not both. The battery direct method is safest and the bus connect method is (usually) easier and more convenient; it’s a matter of personal preference. My portable solar power station uses the bus method. Run your wires in neat, straight runs with tight right angle turns. Be generous with cable clamps and nylon ties. Make it look good! Connect everything except the solar panels and the battery. The system should not have any power applied to it while under construction. Once you have made all your connections and have verified everything is ready, turn the breaker off (or remove the fuse) and connect the battery. Do not connect the solar panel yet. Then turn the breaker on and use a multimeter to check for correct voltage and polarity on the the bus. Turn the inverter on; make sure it’s working. Check any other plugs or accessories you added for correct voltage/polarity. If it all looks good, then plug in your solar panel and set it in the sun. The charge controller should come on line and everything will start working. Check the voltage on the bus again. In strong sun it should be higher than when you tested it without the solar panel. If you got this far with no sparks or smoke, congratulations! You are now harvesting your own 100% off grid energy! The portable solar power station is ideal for radio amateurs who have outgrown smaller panels and kit systems but are not ready to commit to a large scale permanently installed solar array. Do not think of this setup as something to be used only in the field or for special occasions. I suggest leaving the panel outside and using your portable solar power station for everyday radio operating. It will give you solid experience with off grid amateur radio and help you realize its limitations and quirks. You spent a lot of time and money on this project, so use it regularly. The skills you learn now will be of great value when the grid goes down for real. For scouting, church youth groups, and teachers, this would be a great educational tool. When I give public demonstrations, my portable solar power station is always the star of the show. Kids get excited and interested in the idea of useful electricity being made right before their eyes with no fuel other than the sun. Most kids are aware of renewable/alternative energy, but very few have witnessed it in person. It’s a real-world experience they will not forget. Whatever your motivations are, the portable solar power station will go a long way in giving you energy independence for your amateur radio activities. Come see me June 18 in Wheaton, Illinois. Very nice article. And well timed because there is a lot of hype going on right now about Tesla’s solar roofing system. Breaking the whole system down into discrete parts like this makes it a lot easier to understand how the systems work and the actual cost. I agree about the temp sensor. I don’t see a need for it with AGM or deep cycle batteries, which would be the ones used most commonly with this type of system. With lithium batteries a temp sensor is essential, but AGM/DC batteries are just variations of traditional lead acid batteries and they aren’t all that temperature sensitive. If an AGM/DC battery is getting hot during charging, it’s because it’s being charged at way, way too high a rate and the charging system needs to be tweaked to reduce the amount of current being pushed into the battery. The price seems steep at first, but when you consider that something like the Honda or Yamaha 2K inverter sells for around $1,000 or more, and you still need to feed it gasoline which you may not have access to, the price of that solar system starts to seem a lot more reasonable. It doesn’t need oil, doesn’t need spark plugs, doesn’t need to have oil changes, and is going to be far more reliable than a gas powered inverter. It doesn’t have the capacity, true, but it will also never run out of gas, doesn’t need oil or oil changes, doesn’t need spark plugs, etc. Speaking of the Tesla roof system: I ran some numbers and, well, it’s not good from a money point of view. I heard someone claim you could put this roof on for not much more than the cost of a “traditional” roof. Yeah, right. For my house the Tesla system would cost about $100,000 for just the roof alone. Add in sufficient battery capacity to keep the house running during night time, and it comes up to around $130,000 to put one on my house. That’s more than the house is worth. And after running some more numbers and because of our location, it wouldn’t supply more than about a third of the total energy consumption of the household. Anyway, thanks a lot for another great article! I really look forward to seeing these. Hi Randall, as always I’m grateful for your support and comments. I tell others that the solar panels are the cheapest part of the system. It’s the controllers & batteries & all the other stuff you need to turn sunlight into moving electrons that will drain your wallet. That said, once the initial investment is made, it is usually inexpensive to scale it up as needed. For example, this portable solar power station will go to 300-400 watts without having to change much of anything. Just add your panels and extra batteries. You have probably heard the feel-good stories about solar saving homeowners tons of money blah, blah blah. The truth is, only in a few instances under ideal conditions do solar energy systems truly “pay for themselves” in terms of producing electricity substantially cheaper than it can be bought from a commercial utility. Most of the “savings” is due to tricky accounting, overly generous tax breaks, and forcing commercial utilities to buy (at inflated prices) solar-produced electricity they don’t really need. You can make anything look profitable if you jiggle the math and move money from one bucket to another to artificially lower the price tag. In more blunt terms, the guy who is “saving money” with home solar power is really sticking someone else with the true cost of the system. I did not get into off grid power for the money and I do not suggest anyone else should, either. 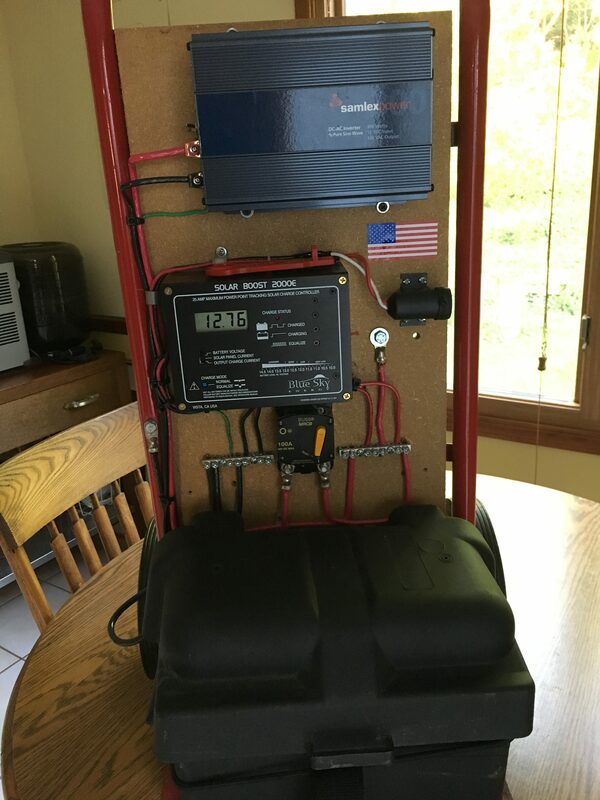 I have many thousands of dollars invested in my off grid power system and I do not expect to ever see a dime of profit…but that was never the point in the first place. We all have to do a personal evaluation and determine why we’re doing this. There are no bad reasons, but some reasons are better than others. Thanks again for your comments. I hope you’ll stop by Off Grid Ham again soon, and invite your friends. 73. Another excellent post, Chris. 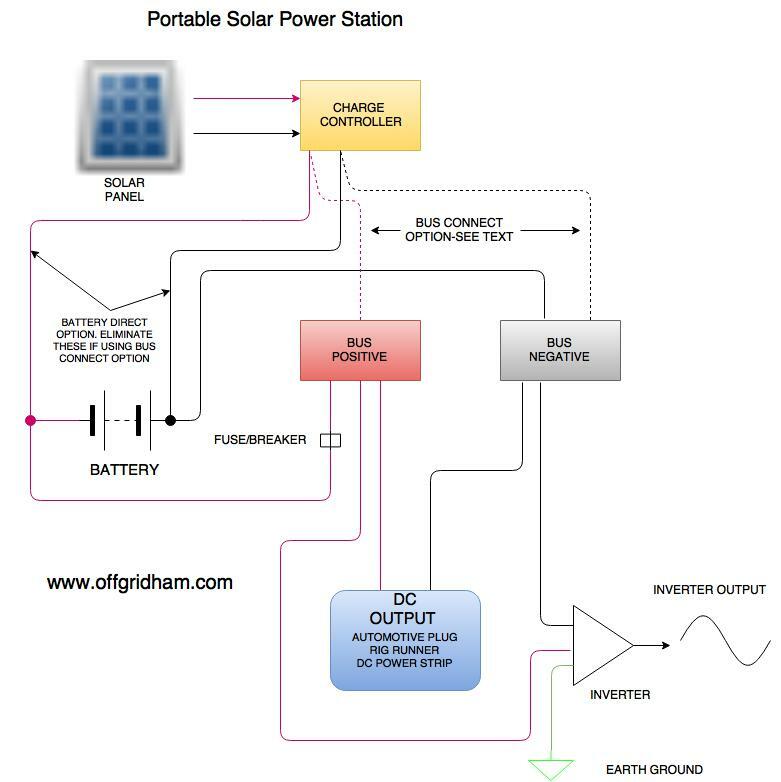 Nice photo of the portable solar power station and great schematic diagram, and parts list w/ options to reduce costs. Very useful information. But what I also really enjoyed was your candid comments about the economics associated these alt.E systems. The federal government provides subsidies via tax credits, state governments do the same. Many states have enacted legislation requiring the electric utilities to incorporate growing percentages of renewable-energy based power by future dates certain – wind and photovoltaic manufacturers have enjoyed ‘boom times’ over the past couple of decades. In most cases the utilities don’t own the systems, but rather just purchase the power at their higher ‘avoided or marginal costs.’ And conventional rate payers end up subsidizing the renewable power users, via a convoluted rate-making process. The schemes goes on and on, and homeowners think the ‘payback’ on their $20K investment is great. Yes, it’s kumbaya time. The average schmoes on the street don’t have a clue they’re financing it all (through their taxes and utility bills), and continue bashing Trump as he brings the party to an end. Ain’t I the cynic! But in the end, there are some nice solar-based systems out there and there are tens-of- thousands of utility-scale wind machines across the country. It ain’t all bad! I can’t think of too many things that make me smile more than hundreds of big wind machines along the road as far as the eye can see. The large wind machines are probably the most economic of all, but the utilities don’t capitalize them (own them) and put them in the rate base, they let bigger risk takers finance the wind and solar farms that ultimately sell the power to the utilities. yada yada… I’ve said too much. You do great work Chris, via your blogs and videos – I’m confident you’ve helped lots of folks work their way off the grid at least partially… radio, lights, small refrigeration… and others in bigger ways. And I realize this isn’t ‘the day job.’ Congrats to you for sharing your knowledge, and thanks for the help! Mike, thanks so much for your flattering compliments! I certainly hope someone has benefitted from this website. After all, I’m not doing this just to talk to myself! I’m here for all radio amateurs but I am particularly interested in reaching out to those who may have wanted to try alternative energy but didn’t know where to start, or thought it was too impractical. As for the politics, well yes it is quite complicated. Off Grid Ham is not a political blog, but in the arena of renewable/alternative energy, it’s hard not to “go there”at some point. I do believe in renewable/alternative energy but I also believe in market-based solutions. I’m not a policy wizard and don’t claim to have any answers, except to say the “answers” currently on the table are unacceptable, nor is it OK to completely cripple an entire energy source (oil & coal) as has been done in the past. Until the miracle cure is discovered, I’ll be out here chugging along and helping others learn how to operate radio off the grid. Thanks again for your input, Mike. I’m grateful for your confidence in me. I WOULD LIKE TO USE THIS ARTICLE IN THE OVARC NEWSLETTER. What are your requirements, other than to make sure you get credit and a link to your website? Fantastic article! A friend and I have been looking into solar generators for home backup use. Your article provides insight and ideas. Thanks! Not using flooded acid batteries because of spillage is uneconomical. No inverter required for LED 12v strip lights and modern radios. No controller required if the source is sufficient to charge the storage in a few days. (check the voltage every day) If your system is overcharging put growing LED’s on your sprouts, 12v in cup tea heater, Peltier cooling module or ? for a diversion load. Small generators are economical and the most reliable immediate source of power, both 120 and 12v. Solar cell arrays are like battery arrays……one bad cell can compromise the entire system.